Two significant construction milestones have been reached at VC Summer unit 2 with the installation of the CA01 'super module' and the installation of the first course of shield building panels, South Carolina Electric and Gas (SCE&G) announced. 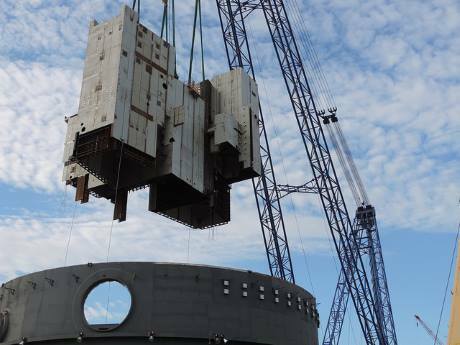 The CA01 was lifted into place on 23 July and is the first module of its kind to be installed at any of the USA's four under-construction Westinghouse AP1000 units. Weighing in at 1089 tonnes, the CA01 is a multi-component steel structure which sits within the unit's containment vessel and houses the steam generator and refuelling canal for the reactor. Over 27 metres long, 29 metres wide and 24 metres high, it is considered a 'super module' as it is too large to transport and was assembled at the construction site's module assembly building. The 171-metre tall heavy lift derrick used to lift it into place is one of the largest in the world. The CA01 was lifted into place days after the first six-panel course of shield building panels was completed on 17 July. The 12-metre long panels, each weighing over 13 tonnes, will be welded together before being filled with concrete. In total 170 panels will be installed to create the shield building, a reinforced concrete structure surrounding the reactor's containment vessel. Two AP1000s are under construction at the SCE&G and Santee Cooper's South Carolina project: unit 2 is expected to start operations in mid-2019 and unit 3 in mid-2020. Two AP1000s under construction at Georgia Power's Vogtle site are also expected to start up in 2019 and 2020.